Fall has barely begun, but it's never too early to start thinking about spring, especially when it comes to planning your next vacation getaway. With cool autumn nights and chilly winter days in the forecast for the next six months, it's time to turn your attention to the much-needed spring beach retreat that will give you something to look forward to and keep you going for another half-year. There's no better cure for the wintertime blues than a spring vacation at Bay View on the Boardwalk on the scenic oceanfront in Myrtle Beach, South Carolina. 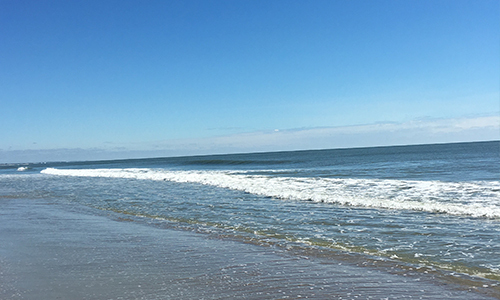 Located in the heart of the Sun Fun Capital, Bay View on the Boardwalk gives patrons the perfect place to celebrate the vernal equinox in true Myrtle Beach style – with sun, surf, sand and all the fun things to do on the Grand Strand. * Discounts: It pays to make your room reservations early, especially at Bay View on the Boardwalk. Guests can receive a 25 percent discount for booking their accommodations early, as well as additional savings through our many specials and deals. For instance, our Advance Purchase program offers more discounts to early birds, and Bay View on the Boardwalk also provides discounts for members of AAA, the AARP, the military and more. Those with flexible dates can earn free nights and take advantage of our lowest rates, and our Bed & Breakfast package features bonus “perks” like free Starbucks coffee. * Events: Much like everything else in nature, Myrtle Beach comes alive in the spring with lots of festivals, concerts and other special events. The Myrtle Beach Marathon (March 2-3) attracts thousands of runners for its Fun Run, 5K, half-marathon and 26.2-mile main attraction. Celebrate St. Paddy's Day (March 17) with numerous Irish-themed festivities scheduled, including the famous North Myrtle Beach St. Patrick's Day Parade & Festival. Watch celebrities tee off in the Monday After The Masters charity golf tournament at the Barefoot Resort (April 9), shag dance the nights and days away at the SOS Spring Safari (April 20-29), or get your motor running at the Myrtle Beach Bike Week Spring Rally (May 11-20). * Location: The Myrtle Beach oceanfront is lined with high-rise hotels, but none offer the combination of comfort and convenience available at Bay View on the Boardwalk. The operative phrase is “on the Boardwalk,” as few other resorts feature direct access to the 1.2-mile wooden waterfront walkway that parallels the coast in the downtown district. Our guests don't need a vehicle to visit some of the top attractions, restaurants, shops and other hot spots on the Grand Strand. Walk to the Second Avenue Pier, Family Kingdom, the Myrtle Beach SkyWheel and more – all just steps from Bay View on the Boardwalk. * Weather: Ahh, we saved the best for last. After a long, dark winter, you are going to want to feel some bright Carolina sunshine on your skin and a fresh ocean breeze in your hair. We hear you loud and clear, and Bay View on the Boardwalk has you covered. Soak up some sun on the beach or the adjoining tanning lawn, take a dip in our heated indoor and outdoor pools, and go for a stroll down the Myrtle Beach Boardwalk under sunny skies and mild temperatures. So what are you waiting for? Book your spring vacation at Bay View on the Boardwalk early, and get ready for the ultimate Myrtle Beach experience.